Many of the variations have two shutter speeds and some of the better constructed have also variable aperture. A few have a waist level view finder in addition to the direct viewfinder. The "HIT" style is a miniature Leica camera and some emulated the Leica 1F with a cylinder for a view finder, but most follow the lines of the Leica IIIf. 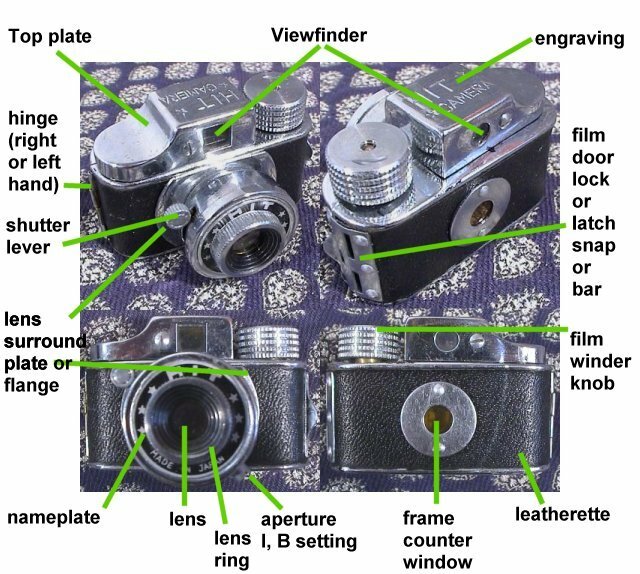 Top plate / View finder housing: The figure below classifying the HIT styles is from William White "Subminiature Photography". The top plate and it's relationship to the film winder knob defines the class. Many of the lesser models are commonly seen in both the Arrow type (Class 3, 4, or 5) and the Star-Lite (Class 8) or Click (Class 9) styles. Add to the mix variations in leatherette colour, in knurl on the film winder, lens surrounds, frame counter window surrounds, fixed shutter or I and B settings, clasps to lock the film door and the combinations produces scores of variations per name. A few have a waist level view finder in addition to the direct viewfinder. 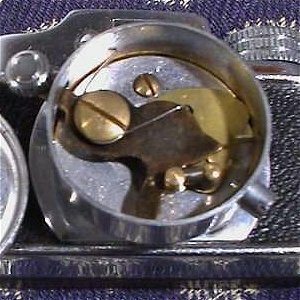 The "HIT" style is a miniature Leica camera and some emulated the Leica 1F with a cylinder for a view finder, but most follow the lines of the Leica IIIf. Film Winder Knob: This is usually on the left hand side of the camera (when held) but is sometimes on the right. A wide range of winder knobs are seen. The thumb grip is normally as vertical lines with one to four horizontal lines engraved in the circumference. These lines also vary in thickness and spacing. The top of the winder knob is usually flat or has a wide cut out giving it a toy wheel appearance. Arrows and "Made in Occupied Japan" are sometimes engraved on it. Lens surround plate or flange: This is usually round and close fitting to the lens mount in a open/close bracket shape ( ). It is also seen with a trapezoid plate as in the QP and with a diamond or open and close triangle brackets <> shape as seen on the Mykro-fine and another version of the QP. Lens: The lens is usually of a meniscus type, 20mm with f8 but also f4.5 setting. The aperture is usually determined by a hole in the plate moved by the shutter lever. The better built 17.5mm cameras have blades that separate or close giving a variable aperture. Lens ring: This it protruding part that 'holds' the lens in place. It sometimes is the fitting for a lens hood or filter. Nameplate: This is the surround area of the lens usually black with white lettering or white with black lettering. The name of the camera is usually accompanied by stars or lines (both sides, but one has been seen only before the name) and "Made in Japan" at the diagonally opposite to the name. Variations in the number of stars, lines and font size increases the number of variations sought. Hinge: Usually on the right side (when held to take a photograph) and with three or five sections. Film door lock or latch: The most common is the sliding bar with the 'hook' at the top of the camera and a finger/thumb cut in the bar to lock the back to the camera. The second most common is the snap to shut lock as seen on the HIT and CMC camera. Sliding bars with a knob in the centre is seen on cameras like the Mykro-Fine and Tone. Shutter: Many of the variations have two shutter speeds, labelled I (instant) and B and some of the better constructed have also have a set of shutter speeds. The shutter lever is a bar on the inner edge of the lens barrel that restricts the shutter from automatically returning. Shutter Lever: As may be expected the lever, or at least the knob at the end of the lever varies in cameras of the same model. Variations in size may be down to manufacturing but some have a stamped concentric circle, some with knurled edges, like the film winder, and others with the centre painted. Frame counter Window: The frame counter is commonly red or yellow but sometimes is green. The surround is normally circular, smooth or ribbed but occasionally is square shaped with the corners top and and bottom. Mycros and the better built cameras also include a sliding cover offering better light trap than the tinted window. The rivets are in different positions, some hidden under the leatherette. The inside surround is equally varied with various shapes and colours of the pressure plate. Some cameras have no pressure plate and on others it seems to function only to hold the rivet. Interiors are usually painted black, but some are matt chrome or only partly painted. The heavier 17.5mm cameras usually have a sliding cover for the window. The grain effect is usually very fine or course. The Arrow Camera, one of the least well made cameras has a nice scale pattern. The material is usually paper as can be seen when worn or if the edges are lifting. Some are black and of a harder and now more brittle material that could even be very thin leather. Finish: The body is usually made of pressed steel plate and have a chrome finish. Some other alloys are used and these have a nickel or matt finish. Also common is a gold tone and more rare in black; perhaps a post production modification. Take up spool: The HIT film is a paper backed roll film. The film is wound onto the take up spool and then film and spool and exposures film take for processing. The spool from the feed side is them put into the take up side. Most take up spools found will therefore not be the original one that was supplied with the camera. Typical spool and frame for most HIT cameras (left), Tone (middle) has a clip that locks the frame in place inside the camera and also a plate for guide, Midget take up spool with a more solid construction. The typical frame holder for the spool is usually have some arms pressed out of the back that assist in guiding the film or retaining tension on the take up spool. These are as varied as the cameras are themselves. A few cameras, e.g. Mighty (above far right), have spring clips attached to the camera body to act in the same way. Some cameras have a large double frame holder that allows the film to be loaded before being dropped into the film chamber of the camera. The film is guided in front of the frame, so the geometric shapes do not act a frame. It is possible to fold the film over the top but then the take up and feed spools force the film path to turn 90 degrees which would lead to scratching and may snap the film.